The title is changed from a Pet Shop Boys album called Alternative and featuring B-sides and alternative versions of some of their songs. I really enjoy the Tamiya re-releases as they are a great opportunity to try alternative paint schemes and modifications on those lovely classics without regrets and worries about failure or “value depreciation”. I build the original versions in box-art and try stuff I always wanted to try on the re-release versions. Hope you like some of them and maybe be inspired to try your own alternative ideas on them. Once again thank you Tamiya for those great rereleases, which other company offers such a chance? This entry was posted in Customized Builds on July 27, 2008 by admin. This entry was posted in Event Report on July 21, 2008 by admin. Unimog designates a range of multi purpose four wheel drive medium trucks produced by Mercedes-Benz, a division of Daimler AG. The name Unimog is an acronym for the German “UNIversal-MOtor-Gerät”, Gerät being the German word for machine or device. They are built in the Mercedes truck plant in Wörth am Rhein in Germany. 1. Medium series 405, also known as the UGN (“Geräteträger” or equipment carrier), is available in the U300-U500 model. 2. Heavy series 437, also known as the UHN (“Hochgeländegängig” or highly mobile cross country), is available as the U3000-U5000 model. 3. U20 is the smallest Unimog. It is based on a shortened U300 frame and has a cab over engine compartment from the Brazilian Accelo light truck (Caminhões Leves) series. The first model was designed shortly after World War II to be used in agriculture as a self-propelled machine providing a power take-off to operate saws in forests or harvesting machines on fields. It was designed with permanent 4WD with equal size wheels in order to be driven on roads at higher speeds than standard farm tractors. With their very high ground clearance and a flexible frame that is essentially a part of the suspension, Unimogs are not designed to carry as much load as regular trucks. 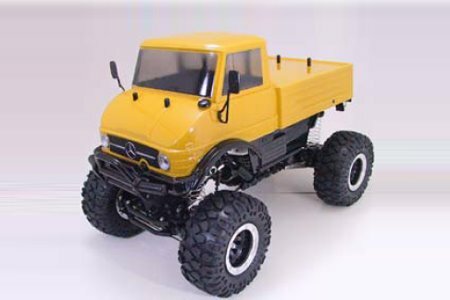 Unimog series is improved constantly and still produced, that is now already 61 years! 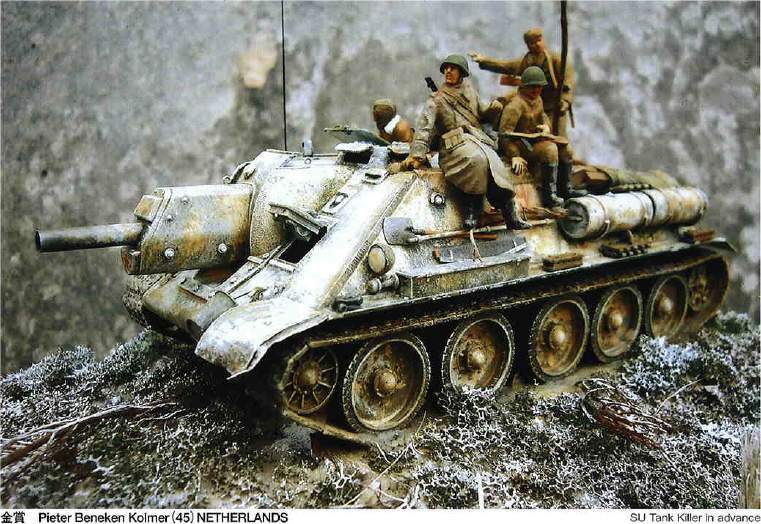 The Tamiya kit includes a 406 body and the 406/416 middle series production started in 1963. They were equipped with a six cylinder diesel (OM312) producing 65 hp (48 kW). The 406 and 416 are similar, The 416 having a longer 2,900 mm (110 in) wheelbase compared to 2,380 mm (94 in) for the 406. Later models were equipped with the direct injection OM352 diesel engines starting with 80 hp (59 kW) and going up to 110 hp (80 kW). Production of the 406 and 416 series ceased in 1988, that is a production run of 25 years for this series! Unimog series numbers like 401, 406, or 425 in this article are the factory numerical designation (“Baumuster” in German). Unimogs also have a sales model number like U80, U120, or U1350. Each series can have several model numbers, as they are equipped with different engines. The “U” model numbers were roughly equivalent to the horsepower of the engine. A 424.121 with a 2,630 mm (104 in) wheelbase equipped with the 100 hp (75 kW) OM 352 engine is a U1000. A 427.100 with a 2,650 mm (104 in) wheelbase and the 100-hp 366 engines is also a U1000. Starting in 1976, model numbers have an extra 0 at the end, which would mean that the Tamiya one is an after 1976 80/84 hp version. However, more recent models like the U5000 are really only rated at 218 hp (163 kW). Tamiya will also release a special lexan colour for it, 86056 PS-56 Mustard Yellow. As a visitor has correctly commented, did Tamiya release so to speak the “Junior” version of the new Unimog in the mid eighties (item number 19009). Though the early Mini 4WD models from Tamiya were mostly “Junior” versions of already existing RC-models, there are quite a few body designs that were first released as Mini 4WD models and then later as RC-models. 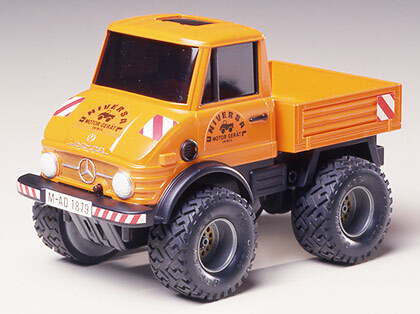 However, the Unimog is quite unique as it took Tamiya more than 20 years to release a “big brother” for their Unimog “Junior”! It’s a “late”, but very welcome release indeed! Update 01.08.2008: Release date in Japan is September 20th 2008. This entry was posted in Future Releases on July 10, 2008 by admin. Vintage Tamiya Poster from 1964 ! Tamiya’s current confidence is not just a model not only the body but it’s good, and not in the building. After-sales service, public relations, market research, study and try to look astonishingly dense activities. It also turned as a manufacturer of plastic model from the beginning. This is our laboratory’s oldest save the poster to the public. 1 / 35 Panther tank’s success since its sold-selling lineup of tanks, 1 / 21, 1 / 35, World Series and the tank is divided into three classes done. Experts also rating higher than 1 / 50 series and Japan Aircraft moving gimmick combined sum of imposing automatic Jaguar lineup. A highlight is 1 / 35 series of new products as “light tank American Destroyer” is being introduced. Carefully 1 / 35 as a model dimensions and “TKK25 motors, C battery x2” written in so far as the model of apparently was trying to file. In fact, this comprehensive catalog describing the 1964 version of it. However instead of being released, and the blank kit No. 10 has a speed contest M41 is a last minute as previously reported. New collection of the museum will be a huge problem, pocket Destroyer T92 series are utilized. It is not just a typographic error in the World Series of Stalin tanks and Crusader’s name is printed on the coming and going wrong. It is difficult to understand in this photo, but Patton bulldog and as far away as polychlorinated caterpillar! (Of course the original rubber caterpillar). 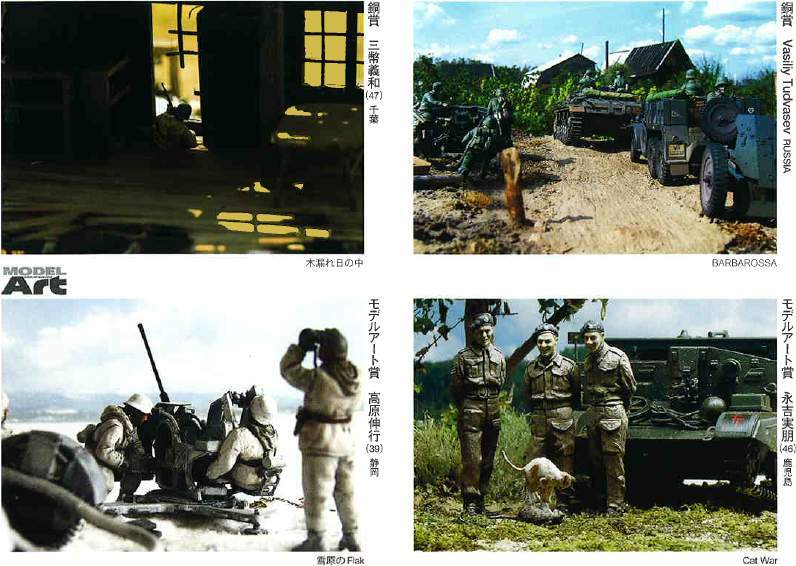 By the way, the bottom of the illustration is Japan’s Shigeru Komatsuzaki soldiers artist, but the ride is the right person in a stream that had been released, but this person is left after a 10-year wait for further vehicles. This entry was posted in Vintage on July 7, 2008 by admin.